Short bell sleeves. Waist - 27". Label - none. Fabric label - none. Length from waist - 40". Sleeve length - 14". V neckline. The main colour is orange/brown, the item is in excellent condition, there was a very small hole on the back but this has been sewn and hardly visible. Cape overlay on bodice. floaty chiffon fabric, sheer. thin waist tie. Waist - 26". Length from waist - 40". bodice is lined / skirt is not lined. 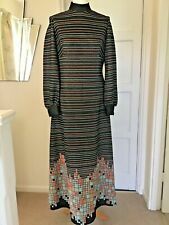 Genuine Vintage Evening Dress Lurex Abstract Design Size 12. Condition is Good. Dispatched with Royal Mail 2nd Class. The dress fastens with a zip at the back and has a material belt to tie the dress to desired effect. There is no designer / maker label or material label but it is man-made material with a silky feel. Empire line style with square neckline with lovely sequin and bead decoration both front and back. Square back. Long sheer chiffon sleeves with popper fastening at cuff. Length - Underarm to hem - 52 1/2". The main colour is orange top/white bottom, there is a lovely silk like lining, the item is in excellent condition. There is no care label so I cannot confirm the exact fibre composition but I think it is Polyester. The material is a Satin-Back-Crepe. The colour is black. Length from underarm of dress to side hem is 47". Beautiful soft pink silky feel shirt. 45cm Shoulder To Shoulder. 70cm length shirt. No signs of age as good as new. Uk size 8 however will also fit a size 10 perfect fitting for a 10 -12 UK. Has panel on front. The colour is vibrant; in a floral 'Azure' tone of Blue. Made in the UK. Size - Size on label says 16. The bodice is lined the skirt of the dress is unlined. Length from underarm of dress to side hem is 36.5". The dress has a net petticoat and two inner petticoats, giving the skirt plenty of fullness. The dress is shown over a 50’s style petticoat for illustration purposes and this is not included in the sale. Patsy Seddon founded Phase 8 in the late 1970’s and this is one of her earlier creations. The dress is a midnight blue colour. The dress has a taffeta shawl style collar, a velvet bodice and a full taffeta skirt. Fabulous frilly vintage blouse! Fab shiny look! Looks fab on! Bought in 1983 for £25 when I was 17! In very good condition. Has covered buttons at the waist and at cuffs of 3/4 length sleeves. Unlined with shoulder pads. Classic 80s tulip shape in beautiful, red satin fabric - it certainly turned heads 35 years ago! The main colour is black, with a burgundy coloured lace used on the bodice. Skirt (Chiffon) - 100% polyester. Bodice (Lace) - 50% viscose, 26% acetate, 24% nylon. Due to the small fit I feel happier to list this as the size I think it will fit rather than the size on the label. Vintage 80s Black Velvet Evening Clutch Shoulder Bag with Beaded Decoration. Satin back with velvet front and colourful beads. Shoulder strap can be tucked inside to use as a clutch. Dispatched with Royal Mail 2nd Class. Party/Wedding Dress Fits 10/12 Fit And Flare Black Asymmetric Top With Red Skirt. Condition is Used. Dispatched with Royal Mail 2nd Class. The colour is a mix of pink & red, the overall colour is pink. Ruched detail on the bodice with frills around the neckline. Length from underarm of dress to side hem is 41". There is no size on the label. 80s VTG Evening Blouse 10-12 patterned party evening top w ith shoulder pads - Your Sixth Sense. Condition is Used. Beautiful baby blue maxi. 19” Pit Pit One Side. Condition is Used. Size given is 11/12 but is a generous 12 . Two Edwardian evening bags. Lined with cream rayon type fabric. Very little bead loss. Clutch bag has press stud fastening. Bead loss as shown in the photos. Width from pit to pit - 17 ". A small bow is on the left side. 19” Shoulder Shoulder. 22” Across waist one side so 44”. 25” lengthwise. 24” Pit Pit. Short wide sleeve top, pleated skirt with side tie bow. Slightly boxy style. Floral empire-line evening dress with flared short sleeves and matching shoulder cape, size 36" (12). The cape fastens with hook and eye but has bow trim. Worn in 1975 as a bridesmaid dress and then to a few parties but shows no sign of wear or age.It has spent many years tucked at the back of my wardrobe so only 1 owner! Gorgeous original 1950's evening dress. Detailed rose print on luxurious blue satin. UK size 12. Empire line dress with bow detail, fluted sleeve and modest high neck - very indicative of the 60's! The dress has been cleaned and is ready to wear! Sleeve (middle and base of neck to cuff) 26". The top textured fabric is slightly see through, so a slip would probably be needed to be worn underneath. Nape to Hem N/A Material Glitter Brocade. An iconic gold 1960s long shift dress. Hip N/A Main Colour Gold. The dress is really well shaped into the body and is very flattering. It fastens at the back with a zip and has been used in various tv and film productions of the 1960s era. THIS SORT OF DRESS IS RIGHT BACK IN FASHION NOW! BACK IN THE 1980'S. SIZE 14 FULL LENGTH DRESS. FROM THERE "YOUR SIXTH SENSE" RANGE. Sizes from size 10 to 18. The pictures don't do this dress justice as it is a really lovely stand out dress. Fully lined, zip and V-back and slight boat neck collar to the front, short sleeves. The main colour is black, with orange & blue/purple print. Size on label says 12. Length from shoulder to hem is 59". Hidden Bra strap fastener for added security. Vintage dress size 10 /12, ruched wiggle style, excellent condition.